When I first visited Jura in the 1980s only a few UK wine professionals seemed to have been there, and only one or two were extolling the virtues of the wines, principally the Vin Jaunes, from this attractive region. This despite its proximity to wine merchant home base, Beaune. Now, of course, there is no wine more fashionable, at least among younger drinkers, merchants and sommeliers. As I’ve said many times, when the classics become unaffordable, wine lovers need to look elsewhere. Jura combines the all important possibilities that can lead to stardom: some old time winemaking gurus, the return of some well travelled sons to established estates, a range of pretty unique wines, a few mavericks intent on quality, and reasonable prices. Only the last of those seems currently under threat, the product of this fame. I organised a small dinner with the aim of establishing beyond doubt that Jura is able to make exciting wines of genuine quality. If the best wines can match the best from other regions, then Jura fashion will become lasting fame. But that’s a lot to ask of a region several French friends joke about, albeit perhaps less loudly now. 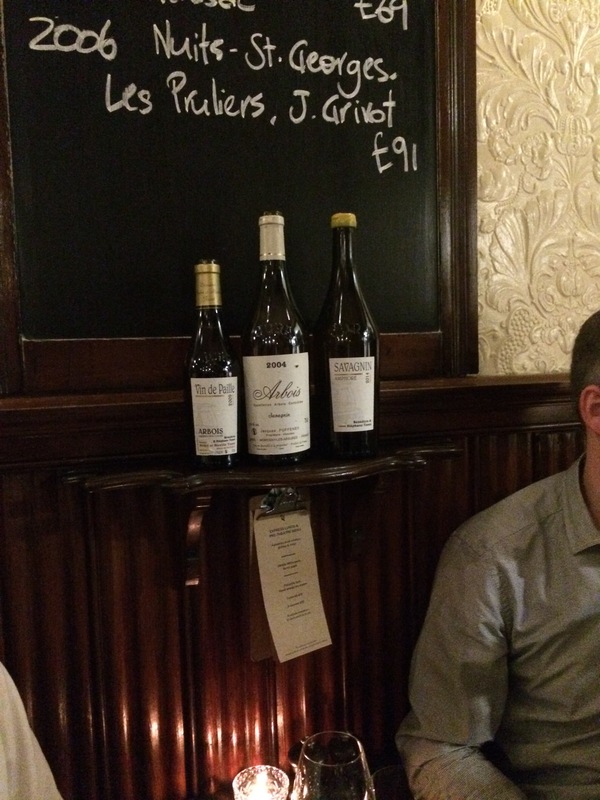 Selecting which wines to take along to Quality Chop House last night was tough, and I settled on seven wines from just four producers: Stéphane Tissot is the well travelled son (Brown Bros in Australia, and South Africa), J-F Ganevat the maverick, and Puffeney and Overnoy/Houillon the gurus. No room for some of my favourite estates who have made a name for themselves more recently (La Tournelle, Hughes-Beguet, Bodines, L’Octavin etc). And the toughest call, no room for that classic Jura red variety, Trousseau (there’s only so much five can drink on a Monday night). I think the evening was an unqualified success. All the wines performed at least approaching what I’d hoped, and several of the wines I’d defy anyone to say were any less stunning than classic wines from classic regions. QCH as usual gave us a wonderful meal, my choices including a mutton starter and monkfish main. We took hard cheese with the Vin Jaune and blue with the Vin de Paille. 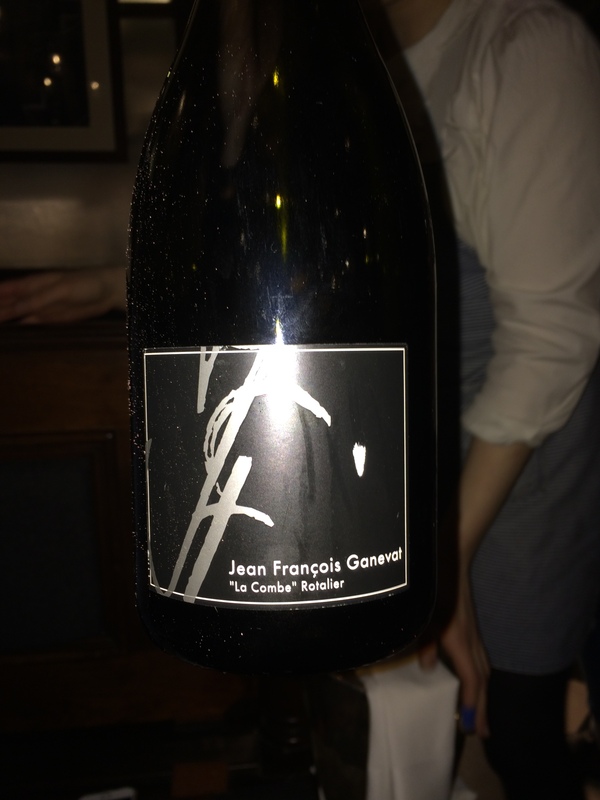 Crémant du Jura “La Combe de Rotalier”, J-F Ganevat is a 12% non-dosé Chardonnay sparkler of real class and interest. There is often something nutty in Jura crémants, you even find it in the famously cheap but decent version Aldi sell, from the Maison du Vigneron in Crançot. 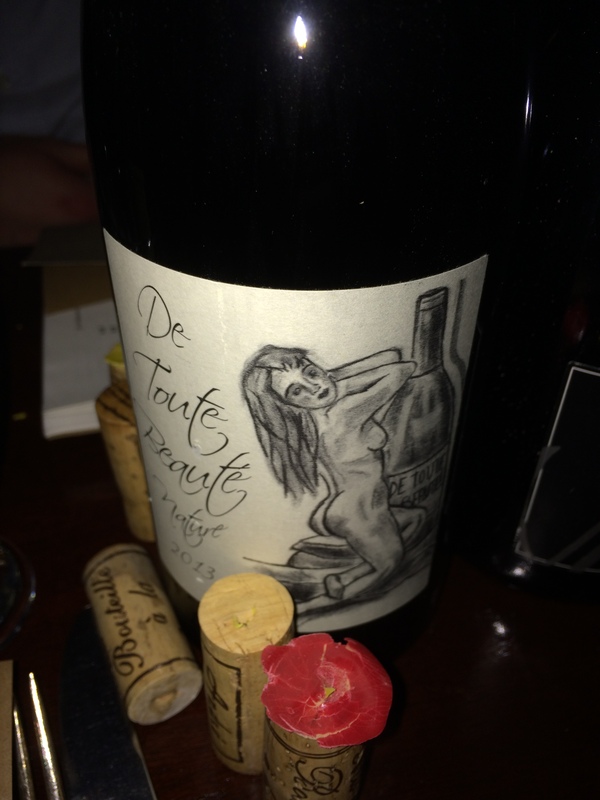 This wine was served as an aperitif last night, but it was more than that, setting the scene for the wines to follow. Although it’s one of the more expensive wines of this AOC, and fiendishly hard to find in the UK, it represents great value compared to average Champagne. Crémant du Jura quality is generally pretty high. 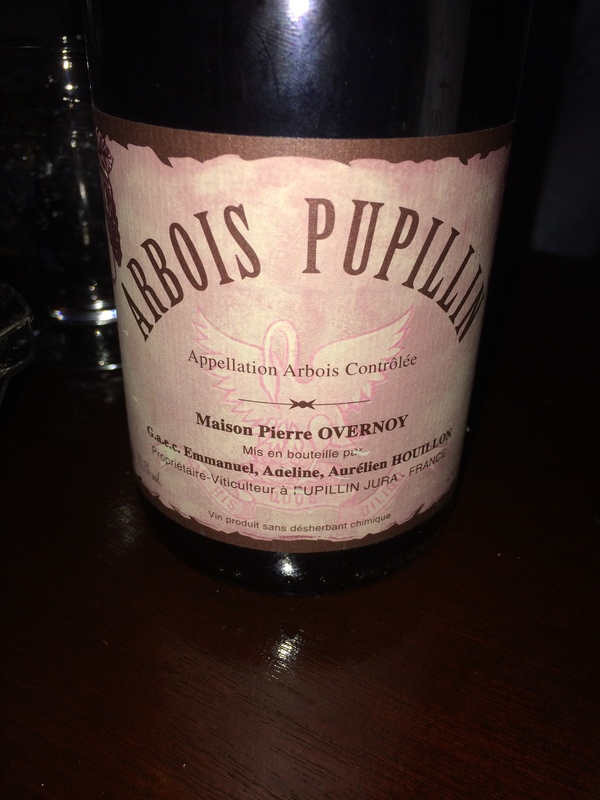 Arbois-Pupillin 2009, Domaine Pierre Overnoy is from one of the famous names of Jura wine, a sage to some and certainly a mentor to many younger producers. His total life commitment appears to be towards quality…and sourdough bread. Whilst Pierre bakes, and strolls through the vines, the wines are now made by Emmanuel Houillon and occasionally other members of that family (Adeline now makes her own wine with Renaud Bruyère, well worth looking out for). This wine is what Pupillin is famous for – Poulsard, or should I say Ploussard, for that is how they spell it in the world capital of this variety. Ploussard produces pale wines, this being no exception. There’s fruit for sure, even a hint of strawberry jam. But it’s an ethereal quality which makes it special, like (in the words of that obscure 1979 single by Teardrop Explodes) sleeping gas. Touch of tea leaf in there too! 12.5% alcohol. Savagnin Amphore 2014, Arbois, Stéphane & Bénédicte (Domaine A&M) Tissot is a little young, but also I think, a wine which is going to be stunning. For starters, at 12% alcohol it lacks the heft of the 15% 2009 we drank at La Balance in Arbois last September (see one of the links at the foot of this post). Sometimes wine tasting terms can be subjective and fanciful, a topic on which I’ve banged on about just recently. But I challenge anyone to say this wine doesn’t smell of curry. Curry leaf to one, but a jar of medium curry powder to me. It has the orange hue to match, and a nice bit of tannin-like texture too. Very limited availability but a tiny bit reaches London. This is probably the first producer in the region to use terracotta on any scale, and Stéphane has a nice line of receptacles in Montigny-les-Arsures (different types too, but we won’t get too technical). Now you can walk into almost any young vigneron’s cave and see one bubbling away, covered perhaps in a layer of cling film to keep the dust out. Stéphane’s is the benchmark. Arbois Savagnin 2004, Jacques Puffeney is a wonder to behold, and although all good things come to an end, the fact that Jacques sold his vines (to the Burgundians at Domaine du Pélican) means that we won’t see its like again (because the current policy of the pelicans seems to be only to make topped-up wines, which might change but this wine sees no topping up). Some people call this a mini Vin Jaune, but that is perhaps to fail to see the uniqueness here. It has that Savagnin tang, softened by eleven years in bottle. Complexity and length (repeated and repeated). 13% alcohol. 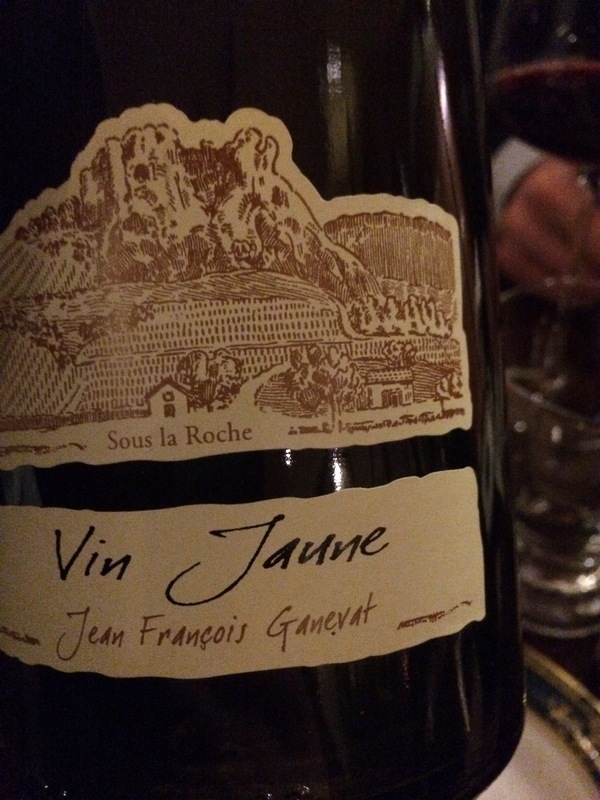 Côtes du Jura Vin Jaune 2003, J-F Ganevat is not a version of this Jura classic of classics from one of the established great names in this genre, but let’s face it, those who know Ganevat want to try his Vin Jaune. And as prices have risen, it’s nice to have this tucked away, bought at a price I could afford a few years ago (Vin Jaune is made purely from Savagnin aged under flor until 15 December of the sixth year following harvest, and is released the following February after the Percée du Vin Jaune, held just a couple of weeks ago in Lons Le Saunier this year, for the current 2009 vintage). This bottle is still a baby in Vin Jaune terms, as it was released six years ago and I’d normally suggest ten years in bottle to be worth aiming for. It has 13.5% alcohol, is nutty and is gaining smoothness, not yet having completely lost the acidity of youth. Of course, there’s Macle, or Berthet-Bondet, both of Château-Chalon, but I think this wine held up the reputation of Jura’s signature style very well indeed. Vin de Paille 2009, Bénédicte and Stéphane (Domaine A&M) Tissot was the only way to finish a Jura wine dinner. Vin de Paille is made from grapes dried either in boxes or hanging from rafters for at least six weeks after harvesting, and then not released until the November, three years after harvest. 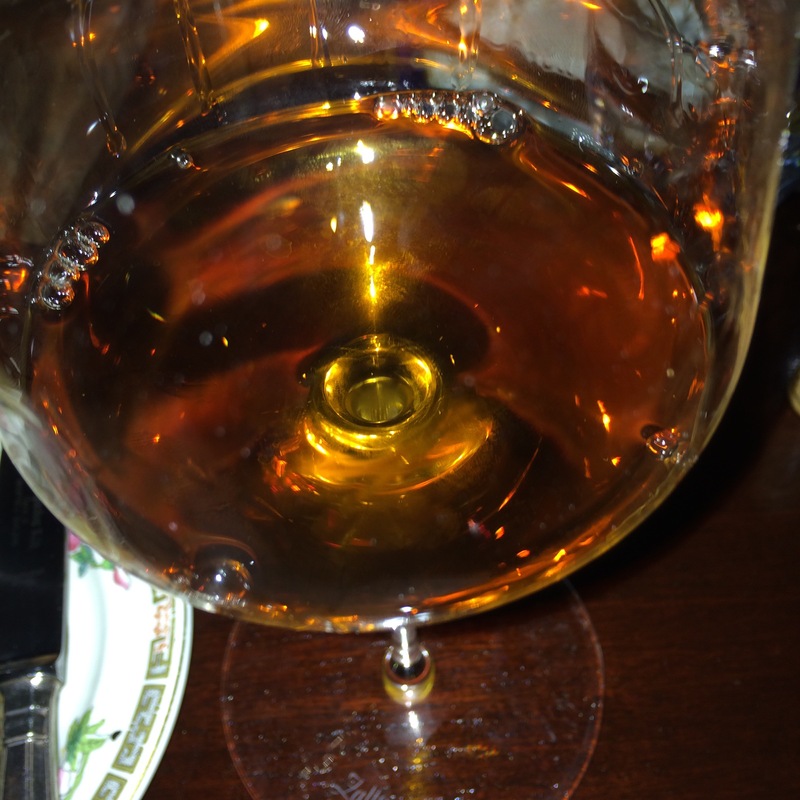 The finished wine must contain between 320g/l and 420g/l of sugar and between 14%-19% alcohol (this had 14%), which is why so many producers, including this one, make so many “non-Vin de Paille” dessert wines. Vin de Paille is both rare and, usually, expensive (as now is Vin Jaune), but it’s a classy dessert wine. Sweet but not cloying, with a nice touch of complexity coming through. Jura is where straw wine originated in France (well, Chave fans might argue), and it’s now being tried all over the world – I’m sure some readers will have read about the Mullineux Straw Wine from South Africa I drank recently. This one is pretty much as good as it gets. 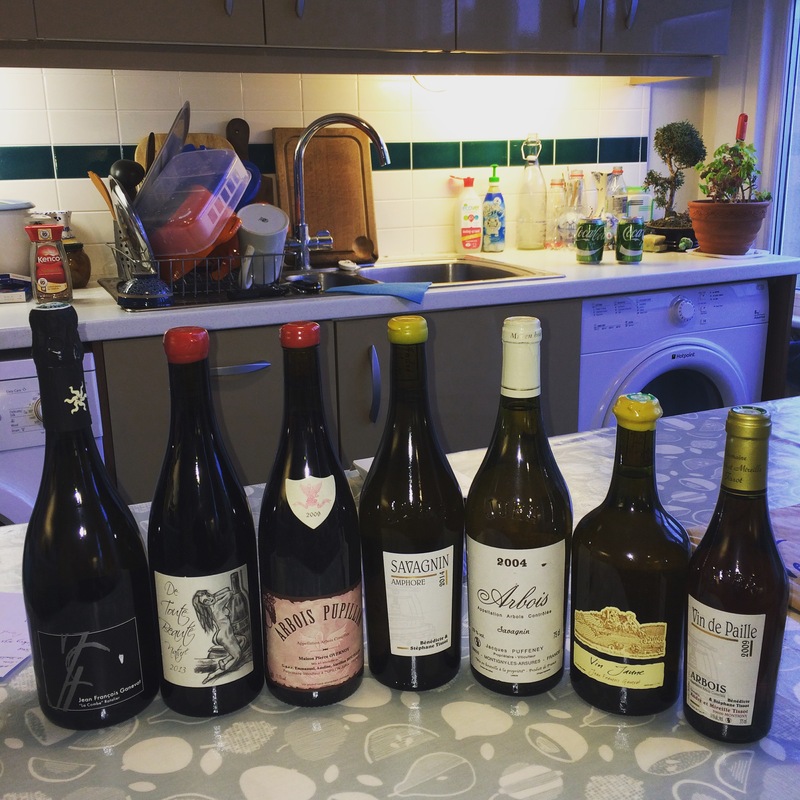 This entry was posted in Jura, Wine, Wine Tastings and tagged André & Mireille Tissot, Arbois, Bénédicte Tissot, De Toute Beauté Nature, Domaine A&M Tissot, Emmanuel Houillon, Ganevat Vin Jaune, J-F Ganevat, Jacques Puffeney, Jura Wine, Pierre Overnoy, Ploussard, Poulsard, Pupillin, Quality Chop House, Savagnin, Stephane Tissot, Vin de Paille, Vin Jaune, Wink Lorch Jura Wine book. Bookmark the permalink. 1 Response to Jurable or Merely Fashionable? Terrific tasting, so jealous of those Jura wines. As you will see I enjoyed a Ganévat myself last night, tasted the vin de voile at Les Affranchis last month and was impressed by the range.